Titanium wedding band made with a white infinity symbol. Made with aircraft grade titanium 6-4 (6% aluminum, 4% vanadium). Available Polished (shiny) or Satin finish (matte) in 5mm - 10mm width. We've created a special epoxy resin blend in our titanium wedding bands that is extremely durable, and can be polished to a near mirror finish. 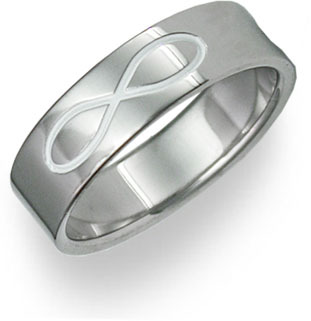 We guarantee our Titanium Infinity Symbol Wedding Band Ring to be high quality, authentic jewelry, as described above.